If sleeping is Heaven, and the frantic late-morning swirl of looking for homework, backpacks, umbrellas, lunches and jackets is Hell, then scrambled eggs for breakfast is the blissful purgatory in between. With dim lights and good food. In the mornings, my bleary-eyed children wander from their bedrooms across our creaky hardwood floors. They wobble into the kitchen where I’m either standing at the stove or basking in the glowing light of our refrigerator. One will reach out and slowly click off the light switches, one at a time, to allow their eyes to adjust to the morning. I hug them and offer them a glass of milk. While my daughter is a “toast and sliced fruit for breakfast” kind of girl, my son is a robust eater. Pancakes and oatmeal are part of the weekly rotation, but more often than not my son requests scrambled eggs. I’ve made so many batches in so many ways over the years that I could make them in my sleep. While I value the creamy small curds of French-style scrambled eggs, my son and I both prefer fluffy scrambled eggs rolling with large, pillowy curds. There is something about the way they look—sturdy, yet soothing— that helps a person transition into the mad rush of a morning. I’ve found that butter and dairy make the fluffiest, most luxurious scrambled eggs. The fat in the heavy cream coats proteins in the eggs. This restricts the excess loss of liquid and contributes to fluffier eggs. Without that extra fat, the proteins can release too much liquid, creating a denser scramble. Heavy cream definitely makes the fluffiest eggs, but it leaves a film of fat on my tongue after eating the eggs that I don’t enjoy. Ultimately, I’ve settled on whole milk, which makes eggs that are rich and fluffy, but still delicate enough to please my palate. Apart from adding dairy, the size of your curds has a lot to do with air, heat, and technique. As long as you keep those three things in mind, your scrambled eggs will be delicious regardless of whether you mix your eggs with whole milk, heavy cream, or water, or use butter or oil to cook them. Think of Michael Jackson and Just Beat It: Get out a small mixing bowl (yes, even for two eggs) and a whisk—a cereal bowl and fork won’t cut it. Aggressively whisk the eggs so they are uniform in color and foamy. This has two functions—color and aeration. Whisking adds air to the eggs, which helps to make them fluffy when cooked. Second, it creates a uniformly golden color. You don’t want bits of yolk and bits of whites in your final product. Low and Steady Wins the Race: Start with your pan over medium heat to melt the butter, but then as soon as you add the eggs, reduce the pan to medium low. You want the curds to form gently and slowly in the pan. The same rule applies whether you are cooking two eggs or ten. Get Pushy: To form light fluffy curds, use a rubber spatula to gently and slowly push the eggs from one edge of the pan to the other. Healthy Shimmer: The eggs are ready when they are set, but still glistening with moisture. If you cook until they’re dry, they will be very dry and rubbery by the time you sit down to eat them. Don’t overcook your eggs! I once heard a chef say the best scrambled eggs have the consistency of dog slobber. I understood his point, but the visual is difficult for me to get around. Your eggs are done when they are no longer liquid, the curds are large and clumped together, but they still glisten with moisture. Anything goes when it comes to turning your scrambled eggs into a larger meal. Feel free to add leftover meat, vegetables, herbs or cheeses to your eggs. If you create something you hate, you aren’t out much so go for broke and get crazy. It’s a low-risk kitchen experiment; eggs are inexpensive and require minimal time commitment. One of my favorite scrambled egg combinations is sweet corn and chives. (I’m from Nebraska so I’m geographically obligated to work sweet corn into as many recipes as possible.) Other possible combinations to consider are sweet peppers and goat cheese; ham, onion, and mushrooms or spinach and tomatoes. I’ve also been known to add roasted vegetables like cauliflower leftover from the previous night’s dinner. There are a few things to consider when adding these ingredients to your eggs. Certain meats and vegetables can discolor eggs (bacon, ham and mushrooms are the first to come to mind). Also, cooking your add-ins along with your eggs could overcook the eggs, making them rubbery and dry, or weepy and watery. Pre-cook your vegetables to release extra moisture. Pre-cook meat in a separate pan to prevent discoloring the eggs. Fresh herbs help brighten the flavor of eggs, don’t be afraid to add basil, chives or parsley. Add meats, cheese, vegetables and herbs toward the end of cooking the eggs, just long enough to mix them in and warm them through. Alternatively, keep them separate and serve them alongside your eggs on the plate. 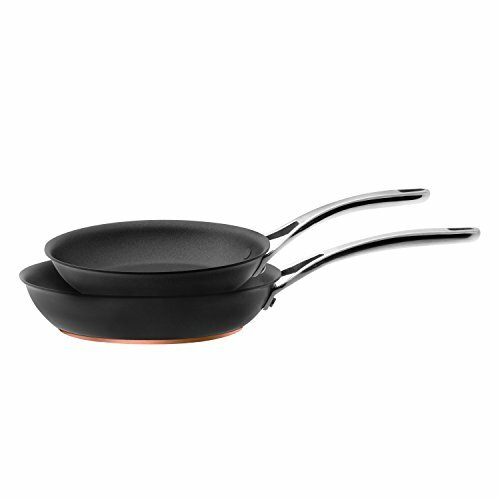 The very best pan for scrambling eggs is a non-stick skillet because the eggs will slide easily without sticking to the pan. You can also use a cast-iron pan as long as it’s well-seasoned (otherwise the cast iron can turn your eggs a greenish shade!). In a pinch, a stainless steel can be used, but use some extra butter or oil to prevent the eggs from sticking too much. According to the American Egg Council, you can crack and mix the eggs together up to two days in advance and store them in the refrigerator without quality suffering. Wait to add the salt, cream or milk until the day you make them. When I go camping with my family, I often crack one dozen eggs into a Ball jar and pack it in the cooler. It makes getting breakfast ready a breeze, and I don’t have to worry about delicate egg shells jostling around in a cooler. Once cooked, scrambled eggs are best eaten immediately or at least the same day, but they will keep in the fridge for three to four days. To reheat refrigerated scrambled eggs, melt some butter in a pan over medium low heat. Add the eggs; they will likely clump together. After the eggs have been in the pan for a minute, gently press on them with the back of a rubber spatula so the curds split up into smaller groups. Turn them around in the pan to coat the curds in butter and warm them through. Two eggs should take about three minutes to warm through on the stove top. The texture isn’t quite the same as freshly made, but they are still delicious. You can also freeze scrambled eggs. People do it all the time with quiche, egg cups, and homemade egg and sausage sandwiches. I have never personally frozen scrambled eggs on their own, but this website provides step by step instructions how to freeze and thaw scrambled eggs. MORE WAYS TO ENJOY SCRAMBLED EGGS! These eggs look as good piled high on a piece of toast as they do alongside sausage and hash browns or sautéed spinach and avocado. If using other ingredients, make sure they are fully cooked before adding them to the eggs. 1 Melt butter in a small skillet over medium heat. 2 Whisk the eggs: Crack two eggs into a small mixing bowl. Add milk and salt. Aggressively whisk the mixture until it is uniform in color, texture, and slightly foamy. You want the whites and yolks fully combined. 3 Scramble the eggs: Add the eggs to hot skillet and immediately reduce the heat to medium low. Use a rubber spatula to push the eggs from one end of the skillet to the other. Continue doing this, gently and slowly, always pushing the cooked eggs from the bottom of the skillet and allowing the uncooked egg to take its place. When the eggs are mostly cooked, but look fairly wet with what looks like thick liquidy egg around the curds, slowly fold the eggs into itself one or two times. You want to bring the eggs together, kind of like a loose ball of dough. Add any cheese, meat or vegetables at this time. 4 Serve immediately: Remove eggs from pan when the eggs are set but still glisten with moisture, and transfer to a plate. Finish with freshly cracked pepper. Garnish with fresh herbs, if using. Hello! All photos and content are copyright protected. Please do not use our photos without prior written permission. If you wish to republish this recipe, please rewrite the recipe in your own unique words and link back to How to Make Fluffy Scrambled Eggs on Simply Recipes. Thank you! I totally disagree about dairy making scrambled eggs fluffy!! Years ago I learned from an Italian chef to use a splash of water per egg, then beat vigorously with a rotary beater (the old fashioned kind). I add a few drops of Tabasco and pour onto the melted butter in the pan. Gently pull around until still shiny, as you say. Voila! The most incredible fluffiest eggs every time! Break 2/3 eggs into a pyrex bowl/jug and whisk. Add some milk (experiance will tell you how much) and whisk. Add a large knob of butter. Place in micro-wave oven and cook for 90 seconds. Stir contents and recook for a further 30 seconds. Stir again and empty onto 2 slices of toast. Water (seriously) is the best trick I’ve found for creamy, silky, fluffy scrambled eggs. 2 eggs + ~1 Tblsp of water, whisked well. Try it! Never EVER add salt prior to cooking scrambled eggs. Talk about taking away the ‘fluffy’, adding salt first will do that for sure. The picture is exactly what pre salted eggs look like while cooking. Sorry to add my ‘two cents’ that you might not appreciate, but I am 60 years old and eat scrambled eggs almost every day. Also, the picture of the ‘stuck on’ eggs in the pan while cooking, is unacceptable. If done right there will be none of that. Heat the pan or pot slowly on medium low, with a lid ajar, whether non-stick or not, does not matter. I do understand the frenzy of cooking in the mornings with young kids needing stuff NOW. Have been there, kids are grown, retired now. I am not a ‘know it all’ about how to cook anything, and to be fair, my eggs are on the firm side, definitely not dog slobberish. I love this website! Definitely on/off heat, good point Paul. Definitely agree with Tammy and Paul. Only water, not milk, and certainly no salt until cooked. My son is also a big pancake breakfast eater, but I’d love for him to do some more protein options. I will try these tips! Hi, Carissa — I hope the recipe helps! Thanks for your comment! Hi, Meme! Emma here, managing editor. Sulfur is found in both the yolks and the whites, and somewhat surprisingly, it looks like whites actually have a higher amount! Check out this article for more info. Regardless, I updated the recipe to refer to “eggs” as a whole and not just the whites. Thanks!